The Trials of Oscar Wilde, at Brighton Pavilion, in April, will reveal what happened during Wilde's trials, drawing on the original transcripts. Only days after the celebrated opening of Wilde's The Importance of Being Earnest, he started legal proceedings against The Marquess of Queensberry for criminal libel – an action which led to three scandalous trials that destroyed his career, wrecked his family and saw him sentenced to two years hard labour. The play is adapted from the full transcript of the libel trial in April 1895 (recently discovered by Merlin Holland after 100 years), contemporary newspaper reports and eyewitness accounts. The Trials of Oscar Wilde enables the audience to experience the full picture of the trials and their shocking aftermath. 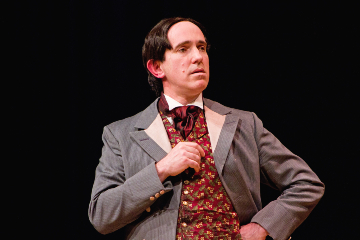 Using the actual words spoken in court, you will get an insight into what it was like to be in the company of a flawed genius - as this less than ideal husband was tragically reduced to a man of no importance. "Oscar Wilde is many people's ideal dinner guest but it"s difficult to imagine how he actually spoke. "However, thanks to the transcripts of the trials, we can hear Wilde's true voice in all its exasperating brilliance. "It's exciting to discover that he did talk in perfectly formed epigrams and paradoxes but the Old Bailey was far too dangerous a place to do that. "The stakes couldn't have been higher. Wilde deflects, stumbles and feints like a boxer up against the ropes but he meets his match in the British Establishment. "His wit is incomparable, his humanity a triumph but his tragedy makes him immortal." The production shows Oscar Wilde fighting for his art as well as his life; we see his complexity, wit and deep humanity using the real facts and transcripts. "Over the years, there have been a number of attempts to tell the story of my grandfather on stage but none of them has really managed to bring alive the drama of Oscar's courtroom appearances." The play should be an obligatory part of every young person's education to teach them the meaning of tolerance and, more than ever in today's world, about the appalling consequences of blinkered homophobia. The Trials of Oscar Wilde at Brighton Pavilion on 10th & 11th April 2019. CLICK HERE for times and tickets.